Andi Peterson of Archbold looks to pass the ball during a NWOAL game with Delta Thursday. The Blue Streaks handed the Panthers their first league loss, winning by a final of 54-44. Braelyn Wymer of Delta drives in from near the three-point line with Archbold’s Gabby Nafziger defending her. Jessie Giguere with the first Delta basket of the game Thursday at Archbold. Despite the loss, the Panthers could claim the league title outright with wins over Swanton and Bryan this week. 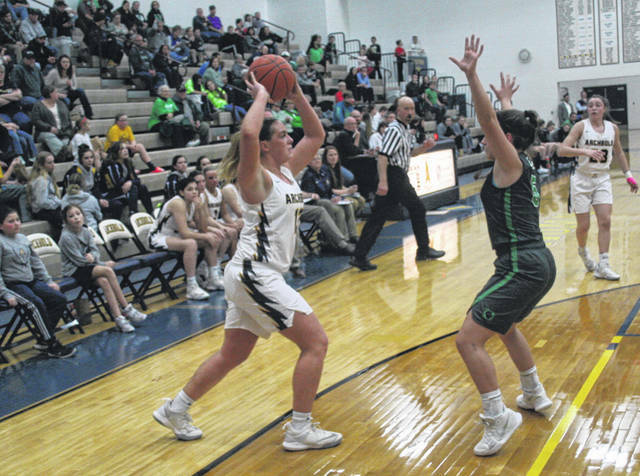 Only trailing once in the ballgame – for a few minutes in the opening quarter – Archbold brought the fight to league-leading Delta in a 54-44 win in Northwest Ohio Athletic League girls basketball Thursday. For Delta, their offense was just out of sync for most of the night. After a Reagan Rouleau putback gave Delta a 6-5 lead at the 3:51 mark of the first, the Blue Streaks responded with a 9-0 run to end the period. First Lily Krieger drilled a jumper from the elbow, then Naomi Rodriguez knocked down a three-pointer and Gabby Nafziger scored off a steal, followed by a Rodriguez bucket on an outlet pass to give the Streaks a 14-6 lead after one. The Streaks hit a pair of threes in that opening quarter, plus three more after halftime. “It’s all confidence,” said Ziegler about his team having a good shooting night. “And I think this group’s getting it. Didn’t have it early on. The other thing is passing the ball. I thought we moved the ball very well and we were unselfish. We gave up a shot, probably to get an open three which was a little bit better. The Panthers got five points from Freeman in a little over three minutes into the second stanza, helping them close the gap. They got it to one, 17-16, after a Brooklyn Green triple at the 4:32 mark. The two squads continued to alternate baskets until a pair of free throws from Harley Phillips gave Archbold a 23-20 lead at the half. Sauder started the fourth off with a made jumper to bump the Streaks’ lead to six. She finished with 11 points on the night, all of which came in the second half. Delta followed with a Green jumper and three by Brooklyn Wymer. 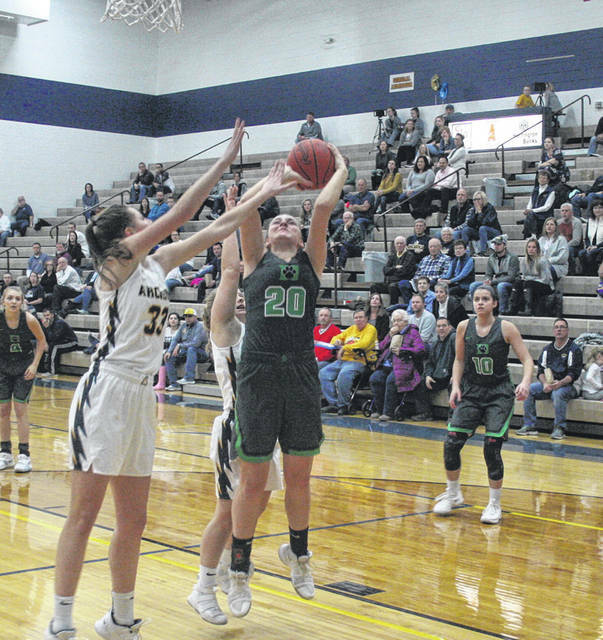 Sauder then converted a drive to the hoop, Braelyn Wymer split a pair from the foul line for Delta, Krieger scored inside and one of two free throws for Addison Moyer extended Archbold’s lead to 43-38 with 2:53 remaining. The Streaks held a 48-44 lead at around the one-minute mark when a technical foul called on coach Ripke essentially sealed the game. In a timeout prior to Rodriguez heading to the line to shoot a one-and-one for Archbold, Ripke made a gesture that the officials deemed worthy of a technical. This also put the Streaks in a double-bonus situation, and Rodriguez hit four straight free throws. However, the key on the night for the Streaks was defense. The Panthers had just one double-figure scorer, as Green notched 12 points. “I thought we played as a team,” said Ziegler when talking about his defense. “When somebody got beat on a drive, there was somebody there to stop the drive and make them maybe alter their shot a little bit. Earlier on (this season) we weren’t doing that. Our teammates didn’t have trust in each other. The Panthers got back on the winning side Saturday at home, topping Clay 63-30. They even outscored the Eagles 26-0 in the fourth quarter. 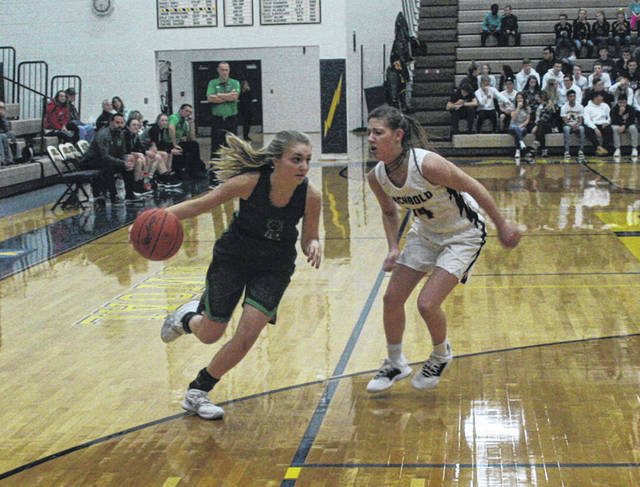 Braelyn Wymer had 16 points while Brooklyn Wymer notched 11. Delta is still in the driver’s seat for another NWOAL title. With Evergreen’s loss to Wauseon, they are at least a game ahead of everyone else in the league in the loss column. The Panthers (16-3, 4-1 NWOAL) will host Swanton this Thursday and Bryan on Saturday to round out league play. Archbold (12-7, 4-2) is at Ottawa-Glandorf Tuesday and Evergreen Thursday.